The SAITM founder was clearly upset when he recently said that those against SAITM would go to hell and burn. His choice of words is unfortunate, but his frustration is understandable. South Asian Institute of Technology and Medicine Ltd. or SAITM has been established under Companies Act No. 07 of 2007 and recognised with the authority to award Bachelor of Medicine and Bachelor of Surgery (MBBS) degree as of 30 August 2011 by the University Grants Commission. 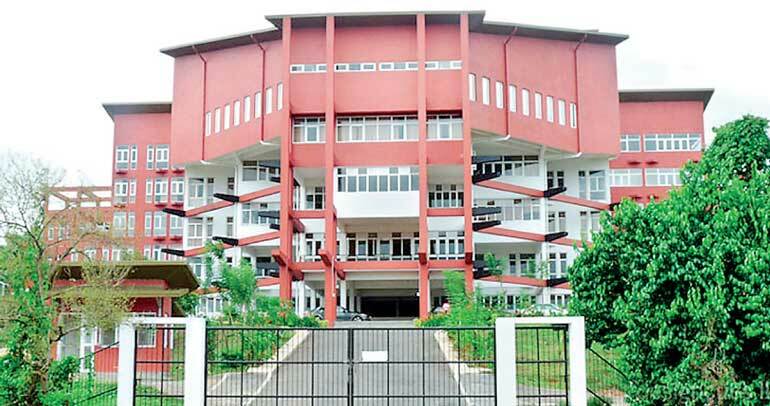 The first batch of MBBS graduates from SAITM is expected to be announced in 2016. However, the Sri Lanka Medical Council had informed the Minster for Health by a letter dated 25 September 2015 that “The degree awarded by SAITM should not be recognised for the purpose of registration under the Medical Ordinance”. This decision is based on an inspection of the Malabe premises by SLMC earlier this year. According to the information posted on the Sri Lanka Medical Council website, it recognises 210 colleges of medicine; 78% of these institutions or 166 are from the Eastern Europe (54), UK, Europe, Australia, New Zealand and other developed countries (45), India (40) and China (13) and Middle East including Libya (5). The remaining 24% or the 44 institutions are from the developing world. The Asian countries in the developing country list account for 33 institutions, namely, Bangladesh 3, Malaysia 5, Nepal 9; Pakistan 14 and Philippines 2. The other developing countries account for 11 institutions as Cuba 1, Nigeria 4, South Africa 2, Tanzania 1, Jamaica 2, Grenada 1 and Zimbabwe 1. As I argue here, the fact of the SAITM case points to a lack of vision by the SLMC. It endorses 210 or more institutions, 24% of them from other developing countries, for the 400 or more students seeking medical education, but, does not seem to do the right thing and go the extra mile to develop local capacity. The UGC recognises degrees granted by any foreign university which is recognised either by the Commonwealth Association of Universities or International Association of Universities. To my knowledge no such international organisation takes responsibility for the quality of the colleges of medicine from across the world. Even that limited reporting function is not carried out by WHO anymore. The new World Directory of Medical Schools, a joint venture of the World Federation for Medical Education (WFME) and the Foundation for Advancement of International Medical Education and Research (FAIMER), merely provides a listing. They very clearly state that they merely provide the data, but not a certificate of approval. The basis for the listing posted by the SLMC is not explicit, but it seems likely that the SLMC acts on the recommendation of their counterparts in each country. Presumably, when a graduate from foreign college of medicine applies to sit for Examination for Registration to Practice Medicine (or ERPM) in Sri Lanka, SLMC would check with their counterpart in that country. Essentially, Government approved councils such as SLMC serve as the ultimate gateways for medical profession in each country. This kind of monopoly power behooves SLMC to exercise it with responsibility but with vison, wisdom and empathy. Whether the SLMC is doing that in the SAITM issue is matter that should receive the attention of all concerned. Actually, the SLMC team did not have to visit the Malabe facility to make that conclusion. The GMOA, the medical trade union, has prevented private medical students from completing their internships at Government-owned hospitals. This is ironic considering that they would be hard-pressed to find many from among its membership who can say they have not or do not engage in private medical practice services through channeling or directly. Guilds were active in medieval times. They are associations of craftsmen or merchants formed to help each other and make regulation and standards for the craft or the trade, but, as the term connotes, this guilds often acted as barriers to entry to the profession. As higher education emerged in Europe and the Americas in the 14th century, they mainly served professional functions in divinity and medicine and by the 19th century universities had become places from broader learning. With the massification of higher education after World War II and the more recent call more relevance in higher education, professional education has been increasingly embraced by universities. In fact in developing countries private initiatives are often dedicated to professional degree programs in IT, business and engineering and those only. In this context, guilds have essentially reinvented them as professional associations working in parallel with universities, but, focusing on the practice of a profession. Membership in a recognised professional association is a goal pursued by any professional. Chartered associations are those given a mandate by government to represent a particular profession. Other associations derive their legitimacy from their track record serving the profession. A charter signifies that an individual has the knowledge and the experience to practice as a full-fledged professional. To become a Chartered professional, a degree or a degree equivalent qualification plus specified level of experience is required. In accountancy, architecture, and law, the linkage between professional associations and the emerging public/private mix of university education institutions in Sri Lanka has proceeded more or less smoothly. In all these fields, the professionals associations have facilitated the transition from academic to the professional domain or have provided paths parallel to and independent from universities. The story of the accountancy profession in Sri Lanka is a story of success driven by adversity. Until the late 1980s there were no private options for pursuing degrees outside of the public university system in any field of study. Even those who gained admission to public universities were forced to find alternatives to keep themselves occupied since student unrest and disturbances due to civil war kept universities closed for periods of time. Thanks to professional associations such as ACCA, CIMA and ICASL, a large number of school leavers, irrespective of their prior categorization into Arts or Science streams, embraced management accounting or financial accounting as fields of study. Today there are many more paths of progression from entry at GCE O/L, GCE A/L to qualifications in accountancy. Today, certification by the Institute of chartered Accountants of Sri Lanka (ICASL) is required to practice as a public accountant with the authority to audit and certify financial documents in Sri Lanka. In 2011, ICASL reported an enrolment of 37,000. Until recently the only way to become an architect in Sri Lanka was to follow the Bachelor of Architecture or B.Arch. degree program at the University of Moratuwa and then join the Sri Lanka Institute of Architects to complete the requirements for the charter. Today the City School of Architecture which offers diploma and a higher diploma in architecture offers a second entry point with an annual intake of 50 or more. The City School of Architecture (CSA) is a result of an initiative by the Sri Lanka Institute of Architects itself. CSA was begun in 1989 to meet the unmet demand for higher education in architecture. The new architecture program was also intended to be more practice-based. Today, school leavers who are interested in a career in engineering have multiple options. Even those who would not have offered Math at GCE A/L can now ‘theoretically’ progress from Technician to Technologist to Chartered Engineer thanks to multiple opportunities provided by public or private institutions. The Graduate Diploma and the Post-Graduate Diploma offered by City & Guilds, Bachelor of Technology degree offered by the University of Vocational Technology (UNIVOTEC) and the Graduateship in Engineering offered by the Institution of Engineers of Sri Lanka are some of these higher qualifications in engineering that provide additional pathways to a charter, but, it should be noted that these arduous paths. Much more needs to be done. Admission to the legal profession, or admission to the bar as it is popularly known, requires success at the final examination of the Sri Lanka Law College followed by admission as an Attorney-at-Law by the Supreme Court of Sri Lanka. The Sri Lanka Law College was established in 1874 by the Council of Legal Education. Although the intake to the Law College is limited to a batch of 250 or so, almost twice as many others with LLB qualifications sit for the final exam as external candidates. For example, in 2009, seven hundred and fifty three candidates sat for the law final conducted by Sri Lanka Law College. Only one third of those candidates were internal students of Sri Lanka Law College. The other two third consisted of LLB graduates. The pass rate in 2009 as whole for the examination was 78%. Those with LLB degrees from the public universities in Sri Lanka including the University of Colombo, Jaffna and Peradeniya and Open University of Sri Lanka are eligible to sit for the Final Examination at the Law College. Graduates of all other institutions, local or foreign, are required to sit for full series of examinations from Year 1 to Year 3 at the Sri Lanka Law College. These examinations constitute 20+ written papers. In 2012, for example, Sri Lanka Law College had received applications from graduates who have foreign degree programs offered by APIIT, British college of Applied Studies (BCAS) and Royal Institute. Clinical practice is more crucial in medicine than in any other profession and SLMC is correct in its focus on the lack of facilities for clinical training at SAITM. However, as the Council responsible for the overall quality of medical practice in Sri Lanka, SLMC should consider whether a monopoly by the State sector is the best for the profession. For example, the current practice of intake to medical colleges based on the Z-score and that score only may open doors for individuals who are not suitable or even dangerous for dealing with patients. While acting as guardian of quality they have a responsibility or create more competition and room for innovation in the professional training of doctors in this country. Professional education in this country will not progress if professional associations limit themselves to being gatekeepers. They have to act with vision and forethought in regard to both quality and access. In this article I have addressed only the access issue saving the quality issue for later. We cannot increase access without investments and the Government clearly should not be burdened with investments in professional education. The SAITM founder says he has to pay Rs. 30 million as interest per month in addition to a salary bill of Rs. 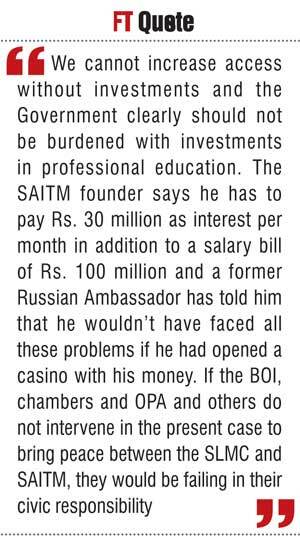 100 million and a former Russian Ambassador has told him that he wouldn’t have faced all these problems if he had opened a casino with his money. If the BOI, chambers and OPA and others do not intervene in the present case to bring peace between the SLMC and SAITM, they would be failing in their civic responsibility.